Me, my new Xbox One and Sunset Overdrive! Well ladies, gentleman and other sentients of varying molecular structure, i have proven that my will is that of ten men! Ten, extremely weak-willed, almost vegetative men. Yeah, I came home from work on Friday and, walking past my Game store, saw a brand new offer and with nary a hesitation, slapped down my card. 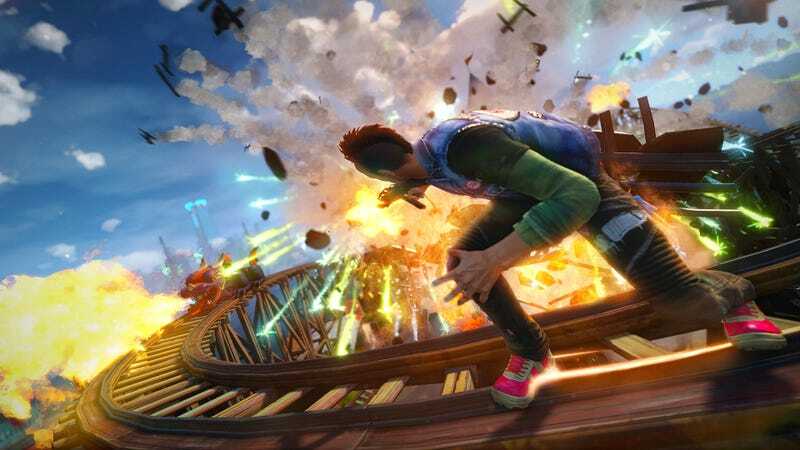 On the bright side, Sunset Overdrive is fan-bloody-tastic. Its like a cross between the Playstation's InFamous series with the ridiculously humor of the later Saints Row games. I'm told there's some Ratchet & Clank in there but i've never played that so i'll take their word for it. Its a pretty solid assault on your senses and its took me several solid hours at the beginning to get to grips with the game's controls of jumping, wall-running, over and under grinding whilst trying to shoot and not die....once you do make that step, its second nature and very, very rewarding. I read Kotaku's review of the game and they had some reservations about the supposedly dire repetitive nature of the 'meta-humor' liberally sprinkled throughout the game. One this particular point, I gotta disagree. The entire game is seemingly structured around its 'meta-ness' and i think if would fall flat if they tried to play it straight for any length of time. Playing it, I had a very strong feeling of being in a sugar-high comic book version of Shaun of the Dead...so much so that i've practically ignored the massive array of clothing sotume options in favour of keeping the original 'working stiff' shirt and name-badge uniform you start off with. The contrast it makes with the psychedelic ridiculousness that surrounds you is just delicious. Basically, the game is a total gem and i'm loving it immensely. The one thing I do love about the Xbox One is the controller and its individual vibration units for each trigger; such a seemingly small thing and it makes an amazing difference, especial driving Forza.